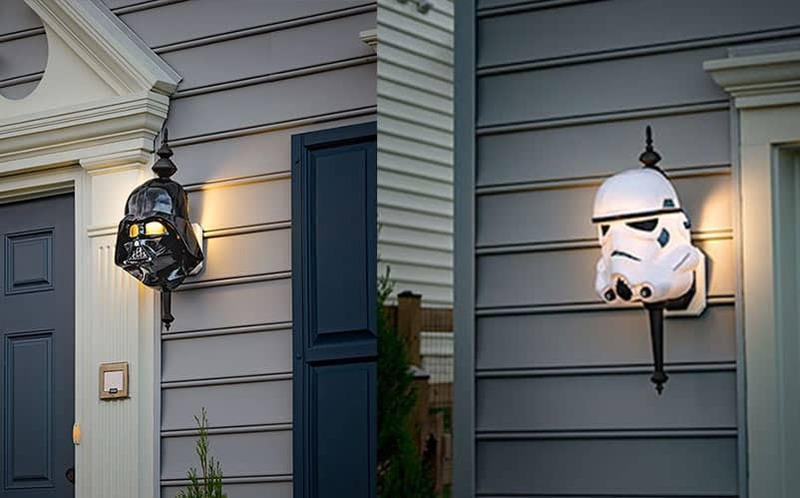 Star Wars Porch Light Covers | Nerd Much? If you want your entire neighborhood and the pizza guy to know that you’re a big Star Wars nerd, check out these Star Wars Porch Light Covers by ThinkGeek. These covers come in two varieties, Darth Vader or a Stormtrooper. They fit right over your existing light fixture, and is safe to use with up to a 60 watt bulb. In fact, they simply attach with an elastic band. They’re both officially-licensed Star Wars merchandise. While the Stormtrooper light cover looks great with a typical white light bulb, placing a red bulb behind the Darth Vader one is the obvious right thing to do. In fact, we’d be upset if you actually used a white light bulb with the Vader one. I mean, who cares about seeing on their porch at night — let’s make Vader’s eyes glow red! For more cool Star Wars stuff to buy, stay tuned to Nerd Much.